After spending the last week seeing all the smaller school programs I’ll be following, today I finally got a look at my first bigger school; the Abilene Eagles. I realized something I should have known already, just because a kid goes to a big school doesn’t mean he’s different than a kid at any other school. For a team that’s had so much success and is expected to contend this year, the boys at Abilene look just like the kids at any other school. To me, this is why high school football is the greatest sport in the world; great teams can be made up of average kids. Commitment, work ethic, good coaching and toughness can overcome talent. 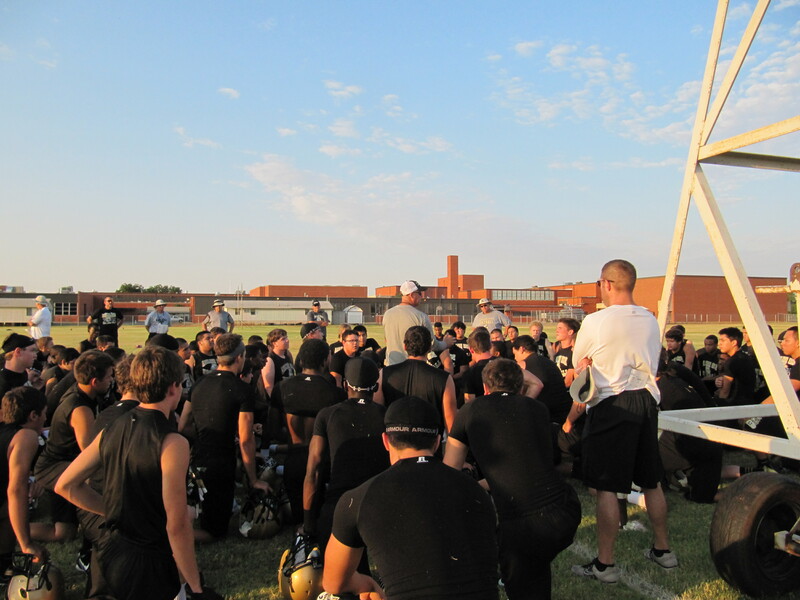 I can’t claim to be an expert of Abilene football after seeing one practice, but I’m guessing those four qualities have a lot to do with the programs recent success. What I did see today was another well organized program where a large number of kids have clearly bought in. The coordination between the lower level and the varsity in all these programs is apparent. At Abilene, the middle school coaches are assisting with the varsity until they start school in a few weeks, meaning 29 coaches were taking part in practice today. This extra manpower both helps during the preseason and shows the middle school coaches how to do things when they’re coaching their kids. Every level of Abilene feeder, from 7th grade up, starts practice with the same warm-up, everyday drills and 24 play passing sequence. This attention to detail has a lot to do with why, after a long drought, Coach Warren’s Eagles have qualified for the playoffs every year since 1999. After they left the field I saw two good workouts, one by the varsity in the turf (?) room and the JV in the weightroom (they alternate by day) this gave me a hint of the toughness I expect to see when I return to Abilene for the week of the Abilene Cooper game. 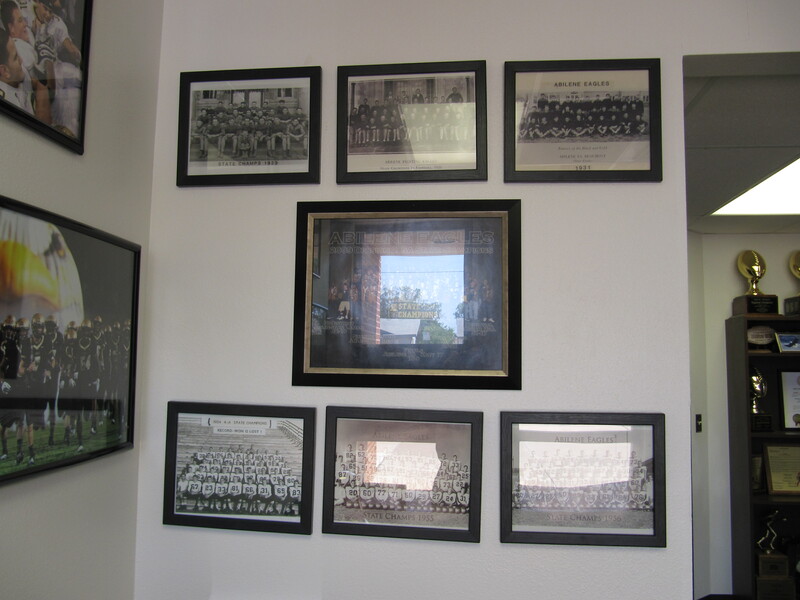 Bad shot of team pictures of all seven of Abilene’s State Champions, most recent on 2010.